Since coming to the Cathedral Community nearly 10 years ago, I have had the pleasure to get to know you and many of our fellow parishioners as people of genuine faith, fellowship and service. I am sincerely grateful for all of the ways you have extended that same service, welcome, and hospitality to me as your pastor and friend over this time. Your past support of the Cathedral Community has sustained the ministry of our parish and assisted us at critical moments. Now, I ask that you continue your support of our parish as we work to address our current needs. As you may know, over the past few years we needed to make immediate repairs to some of our parish buildings. This prompted us to conduct a comprehensive study to evaluate the overall condition of our parish facilities. Through this process, we have been able to identify the most pressing needs of our parish, as well as items that we must be prepared to address in the years to come. It is without question that this is a major undertaking! It has already required much time and effort on the part of our parish committees, which are made up of dedicated parishioners who share their gifts and talents. It will continue to require hard work and sacrifice to raise the funds necessary to complete our repairs and improvements. For over 90 years, generations of devoted parishioners have faithfully built up and cared for the wonderful blessing that we now embrace as our spiritual home. These plans are a sign of our diligent and faithful stewardship; it is our responsibility to bring them to fruition. 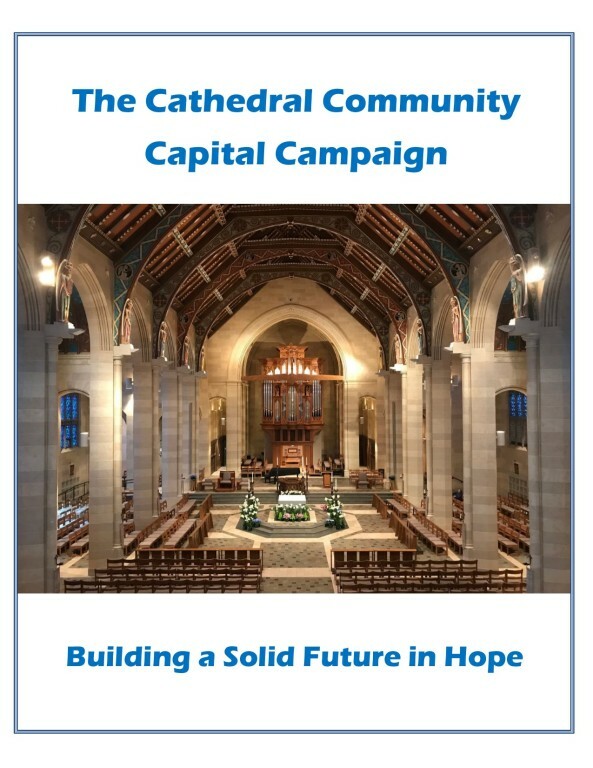 As we begin this very significant phase of our Capital Campaign, we hope to build momentum through sacrificial pledges in order to ensure its success and provide encouragement to other parishioners. As a result of the financial need of this effort, I find myself in a position of approaching you and your fellow parishioners with a significant request. Understandably, we do not know your financial situation and we are very sensitive to your own personal needs. However, I would very much appreciate it, if you are able, to consider a pledge of $5,000, or approximately $20 per week for five years. Such a gift will help us to attain our minimum goal of $1,000,000 and also encourage other parishioners to consider supporting this effort. Please take the time to review this brochure and prayerfully reflect on how you might be able to help. As we thank God for our many blessings here at the Cathedral Community, we hope you will consider a pledge as a sign of confidence in our faith journey and in gratitude to God. We are personally and sincerely grateful for all you have done and continue to do for our parish family.